I’ve previously produced a weekly planner Excel spreadsheet, but recently I’ve needed to use a monthly planner with hourly time slots. It is a simple one page monthly planner. 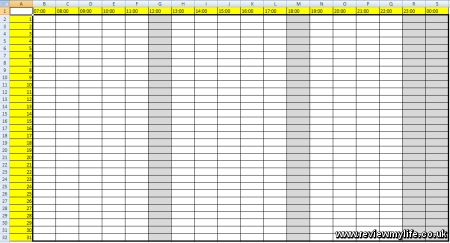 The times from 6am-1am are along the top, and the days of the month from 1-31 are down the side. For the months with 28, 29, or 30 days long you can just cross out or delete the extra days. If you need a different time range it is very easy to edit as well. I’ve saved this as a Microsoft Excel 97 XLS file so it should work in all old or new version of Microsoft Excel or OpenOffice.